Handwriting works magic: it transports us back to defining moments in history, creativity, and everyday life, and intimately connects us with the people who marked the page. 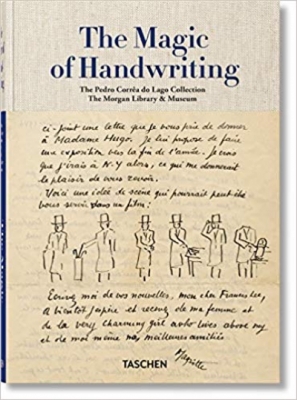 For nearly half a century, Brazilian author and publisher Pedro Corrêa do Lago has been assembling one of the most comprehensive autograph collections of our age, acquiring thousands of handwritten letters, manuscripts, and musical compositions as well as inscribed photographs and drawings. From an 1153 document signed by four medieval popes to a 2006 thumbprint signature by physicist Stephen Hawking, the items illustrated here span nearly nine hundred years, and along the way bring us up close and personal with the writers, artists, composers, political figures, performers, explorers, scientists, philosophers, rebels, and more whose actions and creations have made an indelible mark on humankind. Rather than focusing on a single era or subject, Corrêa do Lago made the ambitious decision to divide his collection into nine areas of human endeavor―art, history, literature, science, music, the performing arts, philosophy, and exploration. On display for the very first time at the Morgan Library, some 140 extraordinary selections gathered in this book include letters by Lucrezia Borgia, Vincent van Gogh, and Emily Dickinson, annotated sketches by Michelangelo, Jean Cocteau, and Charlie Chaplin, and manuscripts by Giacomo Puccini, Jorge Luis Borges, and Marcel Proust. Handwriting is one of the most visceral means by which we leave tracks of our existence. At a time when information and communication have become utterly immaterial, this collection is a seed bank of humanity’s gifts, exploring its most eclectic nuances while transmitting its owner’s unbridled pleasure of being a member, a guardian, and an enthusiastic promoter of our collective story.